For over 40 years, Earth® brands have pioneered design and development of health and wellness-aligned footwear. Earth Origins® is a brand that is defined by a comprehensive balance of style, design, comfort, and value. First envisioned in the late ‘60s by Anne Kalso, the brand brings a modern style and aesthetic to their product, which enriches the wearer’s daily living experience. Those who hold both wellness and comfort top-of-mind when making the right decision for footwear, choose Earth Origins®. All-day comfort technology has been instilled in each pair of Earth Origins® footwear. The padded heel area displaces shock where it occurs most often. Reinforced arch support stabilizes the foot and allows for a corrective alignment. The soft sock lining is breathable and ventilated for a great foot feel. There is also a secondary layer of multidensity latex cushioning that cradles the foot in comfort and relief. Premium materials paired with simplistic embellishments create an utterly versatile shoe with uncomplicated pampering capabilities. In a variety of boot, mule, clog, lace-up, and sandal silhouettes, Earth Origins® provides footwear for any occasion where a tailored shoe is most desirable. Ruching, buttons, laser-cut design, buckles, and straps are details that complement the soft structures and echo a feminine sensibility with fetching shape and thoughtful design. If you are looking to pull together an off-duty ensemble with polish or you are a free spirit that cannot be contained by restrictive style, employ a great pair of Earth Origins® and become the architect of your wardrobe that looks good and feels good, too. I would be a 9-1/2 C in a perfect shoe but usually I can get a 10 B and be happy. Not this shoe. It was a little too narrow. The high back also rubbed uncomfortably against my heel. Style-wise I really liked the regal red color and the cutouts were a cute design. 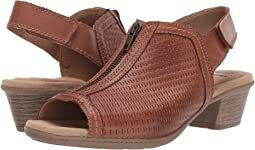 There is a similar version to this shoe, a sandal with a strap in the back, that might work well for me as it also seems to run wide. Loved the style and quality of these shoes. Unfortunately the wide width wasn't quite wide enough and the top of the shoe dug into the top of my foot. Too bad because the style was exactly what I was looking for. Fit and size perfect. I'm very happy with these shoes and for me they look stylish and very comfortable. I'm so happy!